Moses couriered 10 commandments for every Christian to honor, but women in the black church have always operated under an additional set of implicit rules. The learning of them starts when we’re little girls: Don’t sit with your legs crossed because that’s grown, but don’t sit with them too far apart because that’s loose. Don’t go to church bare-legged, but don’t you dare wear fishnets or anything with seams up the back, with your fast, womanish self. Like so many of my ruffle-sock, patent-leather-shoe-wearing sisters, I was inculcated early with the precepts of good-Christian-girl conduct. The church of my youth—one of those tiny, one-room country churches with all-day services and always-broken air conditioning—operated on love and old-school conservativism. Every Sunday, I trailed my nana to her favorite pew three rows from the front to take in teachings about the Lord and the less godly messaging—both subliminal and conspicuous—that has chronically worked to keep female believers silenced and small. 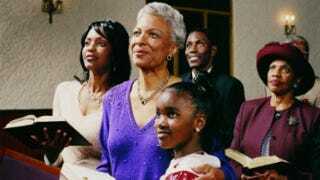 Nobody beats black folks when it comes to ardent loving of the Lord. According to a study by the Pew Research Center, more than half of us go to church regularly, and 8 in 10 say that religion is very important in our lives. But when the practice of that faith is tainted by a hand-me-down tradition of unhearing the needs and realities of women, who make up the bulk of its devotees but remain marginalized, something needs to change, for the girls coming up as much as for the women serving the body now. I love the black church. I am who I am because of it, born and raised under the umbrella of the African Methodist Episcopal doctrine, which is the same denomination in which I’m bringing up my daughter. But I was purposeful about giving her a different experience, a more thoughtful, freeing way to worship that isn’t tangled up in the throwback patriarchy I didn’t reconcile until I was well into my 20s (and I sometimes still wrestle with). I want her to love and honor God, but I also want her to love and honor herself. And quiet as it’s kept in the regiment, the two can happen harmoniously. I learned that our flesh has the power to make men weak, so it was our responsibility to cover up, so as not to distract them with our exposed arms and décolletage and kneecaps, and to keep their lascivious thoughts in check. Skylar wears what she wants to church, jeans included, so long as it doesn’t disrespect the house in general, and she’s been informed that her body is hers—not only by me but also by the men and women on the ministerial staff who don’t assign the work of building self-aware, resilient girls to women alone. I learned that good girls who love God bottle up their sexuality and ignore it as if it doesn’t exist, that a woman’s virtue is a would-be gift to a husband who may pride himself on being the one to break her in. Skylar knows that God’s love isn’t contingent on anything she does or doesn’t do, that it’s the one thing she can always depend on. Our conversations about her sexuality are real—way realer than the “Just don’t do it” I was brought up on. In church, where we’re at our most vulnerable and receptive because we’re reaching out and wanting to hear from God, we’ve traditionally been pervaded with messages that diminish our womanhood and have us modeling ourselves after women who lived thousands of years ago. It forces those who fall short of the prescribed expectations to do their dealings in the dark, uninformed and unsupported, particularly when they need fellowship and connectivity the most. Ask a teen mother how long it took her to get up the nerve to face the congregation after she came up in the family way. My daughter rolls her eyes at my pro-womanism, but she benefits from it. She gets to bypass all of the baggage I had to sort through and get straight to the business of focusing less on the social politics of the church and more on who she is in the Lord and who he is in her. My hope is that she will be part of the young, analytical, thinking, believing, spirited collective rewriting the narrative black women have been hearing for their whole long lives in God’s sacred space; that she won’t get frustrated and leave the church, but use her intelligence and power to help reinvent it.